Updated: 6:07 p.m. | Posted: 9:35 a.m. The one-sided 407-23 vote belied the emotional infighting over how to respond to freshman Rep. Ilhan Omar's recent comments suggesting House supporters of Israel have dual allegiances. For days, Democrats wrestled with whether or how to punish the lawmaker, arguing over whether Omar, one of two Muslim-American women in Congress, should be singled out, what other types of bias should be decried and whether the party would tolerate dissenting views on Israel. Republicans generally joined in the favorable vote, though nearly two-dozen opposed the measure. Generational as well as ideological, the upheaval was fueled in part by young, liberal lawmakers — and voters — who have become a face of the newly empowered Democratic majority in the House. This group is critical of Israeli Prime Minister Benjamin Netanyahu's government, rejecting the conservative leader's approach to Palestinians and other issues. Omar and two other House Democrats, Reps. Rashida Tlaib of Michigan and Andre Carson of Indiana, issued a statement following the vote Thursday afternoon that they are "tremendously proud to be part of a body that has put forth a condemnation of all forms of bigotry including anti-Semitism, racism and white supremacy." "At a time when extremism is on the rise, we must explicitly denounce religious intolerance of all kinds and acknowledge the pain felt by all communities," the statement reads. The group split sharply from Democratic leaders who seemed caught off guard by the support for Omar and unprepared for the debate. The resolution passed Thursday condemns anti-Semitism, anti-Muslim discrimination and bigotry against minorities "as hateful expressions of intolerance." Some Democrats complained that Omar's comments had ignited the action after years of President Donald Trump's racially charged rhetoric led to no similar congressional action. The seven-page document details a history of recent attacks not only against Jews in the United States but also Muslims, as it condemns all such discrimination as contradictory to "the values and aspirations" of the people of the United States. The vote was delayed for a time on Thursday to include mention of Latinos to address concerns of the Congressional Hispanic Caucus. The addition came under a section that stated in the end, "Whereas white supremacists in the United States have exploited and continue to exploit bigotry and weaponize hate for political gain, targeting traditionally persecuted peoples, including African-Americans, Latinos, Native Americans, Asian-Americans and Pacific Islanders and other people of color, Jews, Muslims, Hindus, Sikhs, the LGBTQ community, immigrants, and others with verbal attacks, incitement, and violence." Speaking before the vote, House Speaker Nancy Pelosi said she does not believe that Omar understood the "weight of her words" or that they would be perceived by some as anti-Semitic. The resolution does not mention Omar by name. "It's not about her. It's about these forms of hatred," Pelosi said. Asked whether the resolution was intended to "police" lawmakers' words, Pelosi replied: "We are not policing the speech of our members. We are condemning anti-Semitism," Islamophobia and white supremacy. • Tell MPR: What are your thoughts on her remarks and House Dems' reaction? A statement from Sen. Elizabeth Warren of Massachusetts said, "Branding criticism of Israel as automatically anti-Semitic has a chilling effect on our public discourse and makes it harder to achieve a peaceful solution between Israelis and Palestinians." She said threats of violence, including those made against Omar, "are never acceptable." Many Democrats are able to navigate the terrain between their support for Israel and their criticism of Netanyahu. Some take official visits to Israel and attend the annual AIPAC conference, a premier event of a prominent lobbying group, coming later this month to Washington. But Omar's rhetoric is taking Democrats to a place that leaves many uneasy. The new lawmaker sparked a weeklong debate in Congress as fellow Democrats said her comments have no place in the party. She suggested politicians have "allegiance" to Israel, reviving a trope of dual loyalties. It wasn't her first dip into such rhetoric. Thursday's measure, a stand-alone resolution, was in part intended to resolve a divide that opened after Omar said that Israel's supporters were pushing lawmakers to take a pledge of "allegiance" to a foreign country. A Muslim-American, she has been critical of the Jewish state in the past and apologized for those previous comments. But Omar has not apologized for what many in Congress saw as her recent suggestion that Israel's supporters in the U.S. have split loyalties. And that sparked the divide among Democrats that could stretch into the 2020 election season. Sen. Kirsten Gillibrand of New York called the new version of the resolution "appropriate." "Everyone is entitled to their opinion, they are allowed to have free speech in this country," Gillibrand said. "But we don't need to use anti-Semitic tropes or anti-Muslim tropes to be heard." But other House Democrats wanted to broaden the resolution to include a rejection of all forms of racism and bigotry. 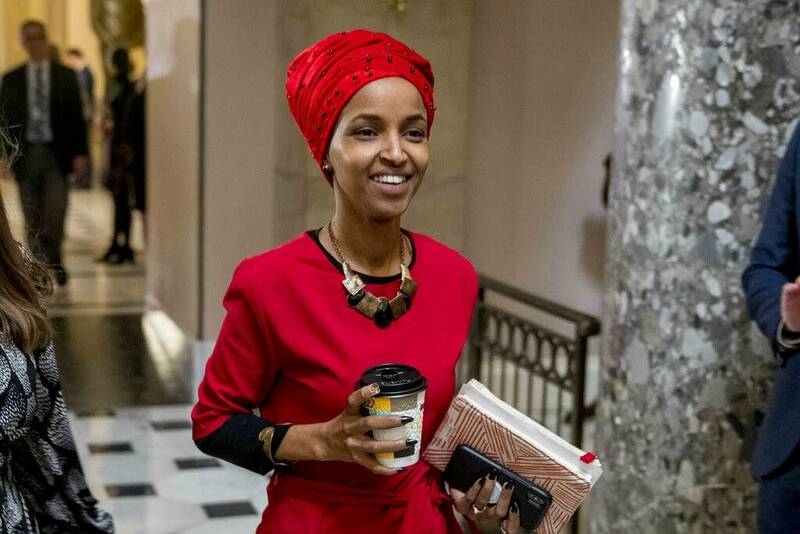 Others questioned whether a resolution was necessary at all and viewed it as unfairly singling out Omar at a time when President Donald Trump and others have made disparaging racial comments. Meanwhile, Democratic leaders were trying to fend off a challenge from Republicans on the issue.